Alfred Newey was born in Cradley in 1882. Alf’s family came from Cradley, his father’s work as a coal miner having taken them to Yorkshire. 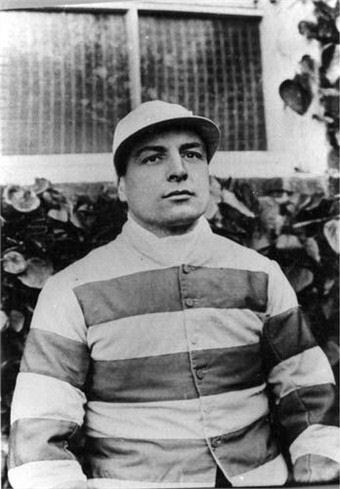 As Alfred was interested in horses at age19 he started working at a local stables in Brereton, Lichfield and in 1902 applied for a jockey’s licence. 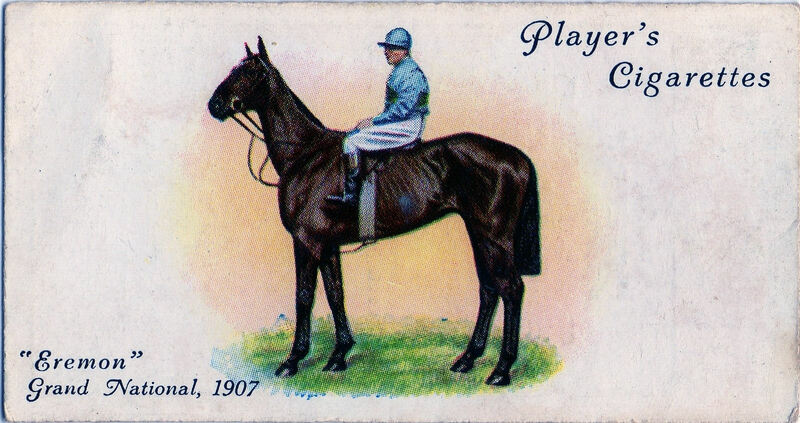 In the years to come he was runner up in the Jockeys Table, won the 1907 Grand National on Eremon, the Scottish Grand National on Creoline and the Welsh Champion Hurdles on Assaroe. He later trained at Hednesford and sent out Gracious Gift to win the Liverpool Foxhunters. 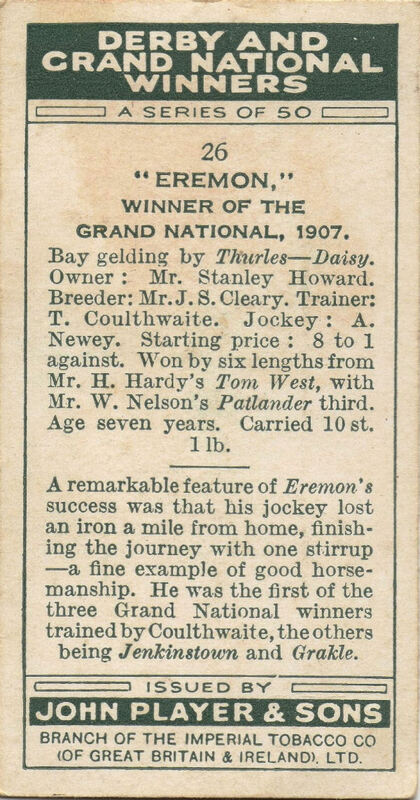 Alf had come third in the 1905 Grand National and in 1907 Eremon was a relative novice. Eremon was though expected to perform very well which his 8-1 odds showed. During the race the jockey broke a stirrup at the first fence but did well enough to stay on and lead at the Canal Turn on the first circuit before another strange Grand National event took place when Rathvale who had unseated it’s jockey came up alongside Eremon and tried to viciously bite the horse. Alfred Newey tried to scare the horse away with his whip but with no success as the pair raced side-by-side for an entire circuit until he finally pulled away to win the race over Tom West by six lengths. Alas, shortly after his Aintree triumph, Eremon got loose at exercise and was fatally injured. Alf married Gertrude Corbett in June 1907 and they are recorded on the 1911 census as residing at Prospect House, Hednesford, Alf now a jockey and trainer, with 9 employees. Alfred moved from Cradley to Hednesford with his family where he worked as a horse driver at the Rawnsley colliery,a horse trainer from the area had somehow noticed Alf’s potential-how is unclear! But nevertheless he spent eleven years under the man’s wing, and learned to ride under an apprenticeship scheme. Meanwhile a Manchester-born horse trainer by the name of Tom Coulthwaite had around the turn of the century, settled on the edge of Cannock Chase and established a stables at Hazel Slade which had quickly gained an enviable reputation. With the grand national approaching, Coulthwaite was readying Eremon for glory, despite the horses humble almost comically so background. Eremon had been bought for fifty quid (50 pounds) and had worked in his youth as a cart horse, but after some intensive work at hazel slade Eremon was winning races, and Coulthwaite was confident enough in him to pit him against the very best in the biggest race of all. He chose Alf newey as the jockey, despite advise to the contrary by others in the business. The black country rider lined up with the cream of the sport at Aintree that march. Coulthwaite would have been forgiven a self-congratulatory grin as Alf led Eremon to the front of the field from the start, in perfect conditions and in front of the packed course. Then at the second fence one of Alf’s stirrups broke, and he faced the proposition of riding out the entire race completely off–balance, just staying on the horses back would have been difficult enough, let alone taking the remaining fences at an angle. But Then Rathvale a rival hore, threw his rider and decided to accompany Eremon all the way home, as if he didn’t already have enough on his plate, as the two rode neck and neck for the rest of the race, Alf with one eye on the chasing pack and one foot swinging free had to lean over every few yards and crack Rathvale on the head with his whip handle, it did the trick-he backed off just to follow the triumphant Eremon over the line just a yard or two behind, the black country jockey had ridden himself into the history books, despite the days mishaps, on a former carthorse. Alf was described as being broad and short legged. As well as the grand national he won the Scottish grand national on crinoline and the welsh champion hurdle on Assaroe, later he trained at Hednesford and sent out gracious gift to win the Liverpool foxhunters. By 1911 he was described as a trainer/jockey living at prospect house Hednesford. Not bad for a black country miner who had started off in a little village called Cradley. I think all of Cradley turned up at the grand national that year to watch and see “our Alf romp home.